A big thank you to everyone who helped make the end of year matching campaign such a success! Thank you to matching donors Mardy Schweitzer, Israel Wolraich, Shoshi Wolraich, Shlomi Wolraich, Michael Goldhirsh and to all of you who so generously joined in and contributed! It is amazing what can be done when we all team up. Thank you for partnering with us! 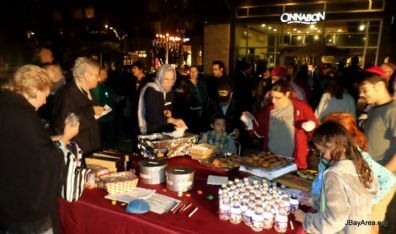 A wonderful turnout and a great time was had at the Chabad of the Bay Area Chanukah events! 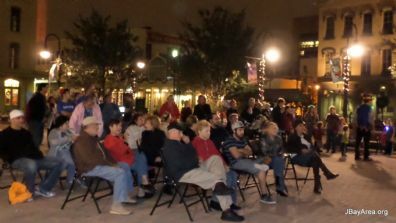 Check out the photos of the beautiful Floral Menorah at Baybrook Mall, Chanukah on the Strand at Galveston's Saengerfest Park, and the Menorah Lighting at Pearland Town Center Mall! Watch a VIDEO clip of the lighting of the one-of-a-kind Floral Menorah at Baybrook Mall! Tuesday: Please be part of our Special 24 Hour Matching Campaign! This Tuesday, December 23rd - the 7th day of Chanukah, Chabad of the Bay Area will hold an special 24 hour fundraising campaign. For 24 hours only, every dollar that you donate will be doubled on the spot by matching donors! Chabad of the Bay Area counts entirely on the grass-roots support of people like yourself to enable its work. Your participation in this special campaign will help us cover this year's budget and be on firm ground for continued activities and growth in 2015. Please stay tuned and just think about the impact you can make when your generous gift is doubled! To get in early, donate at www.jbayarea.org/give, your donation will go towards the matching campaign. Or by mail: 1910 Claiborne Dr, League City, TX 77573. Thank you in advance for your partnership and support! Closing out another wonderful year! As this fiscal year comes to a close, we look back at a year of activities and outreach that touched many of our Jewish sisters and brothers in the Bay Area, with insightful classes, meaningful Jewish celebrations, Shabbat and holiday dinners, welcoming services and above all, one-on-one caring interactions that enriched and uplifted the lives of one individual and family at a time. As an independent startup non-profit, Chabad of the Bay Area is made possible by your partnership and generosity. Every little bit counts and makes a difference. Please consider making Chabad of the Bay Area an important part of your end of year, tax-deductible giving. This Sunday - Jewish Kids in Action! It's not too late to reserve for Jewish Kids in Action to be held this Sunday, December 7th, featuring the fun baking of Chanukah treats and much more! RSVP to malky@jbayarea.org.